dbForge Team is excited to inform our PostgreSQL users that the wait is finally over – a steaming hot dbForge Studio for PostgreSQL, v2.0 has been just rolled out. The release features a brand new Standard edition with new exclusive features and a bunch of essential updates and improvements. 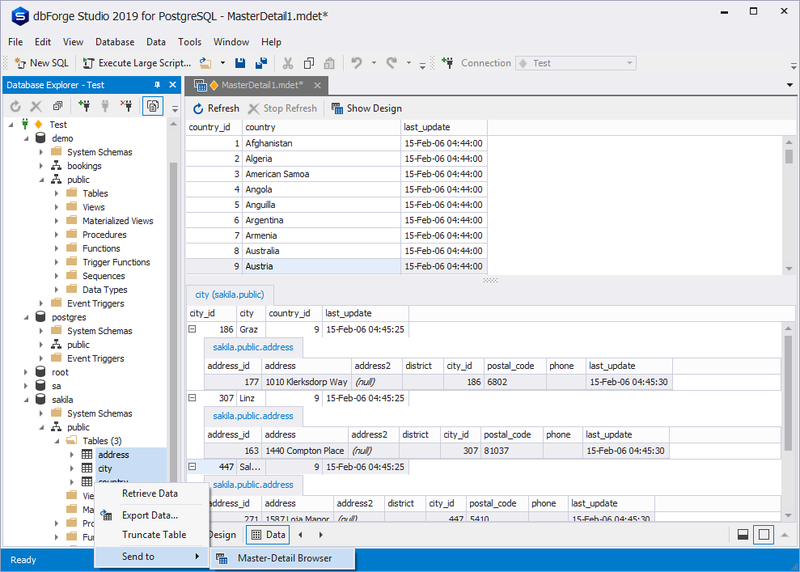 Now dbForge Studio for PostgreSQL has two editions, a free Express edition with basic functionality, and a new Standard edition with advanced features. The Standard edition can be evaluated at no cost for 30 days. When this trial period expires, you can purchase a license to continue enjoying exclusive features or it will be limited to a free Express edition. 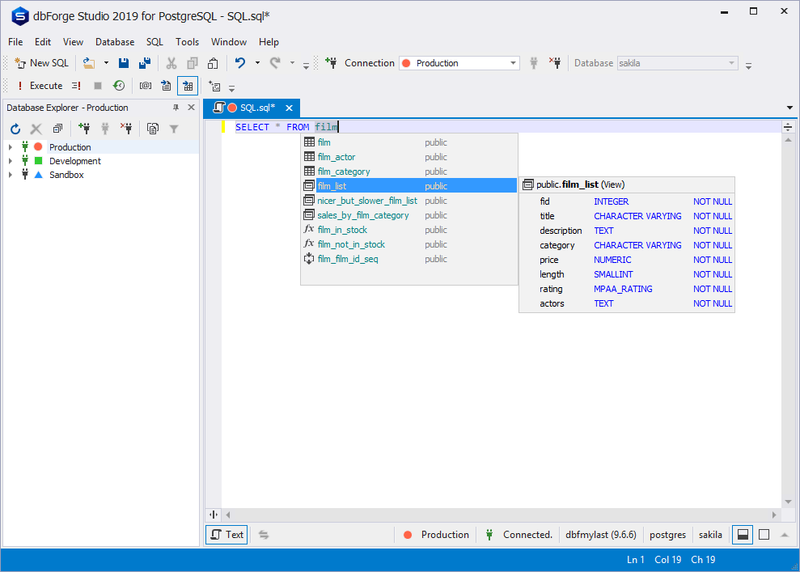 To learn more about editions of dbForge Studio for PostgreSQL, refer to the Editions page. The feature allows filling PostgreSQL databases with external source data and migrating data between systems. 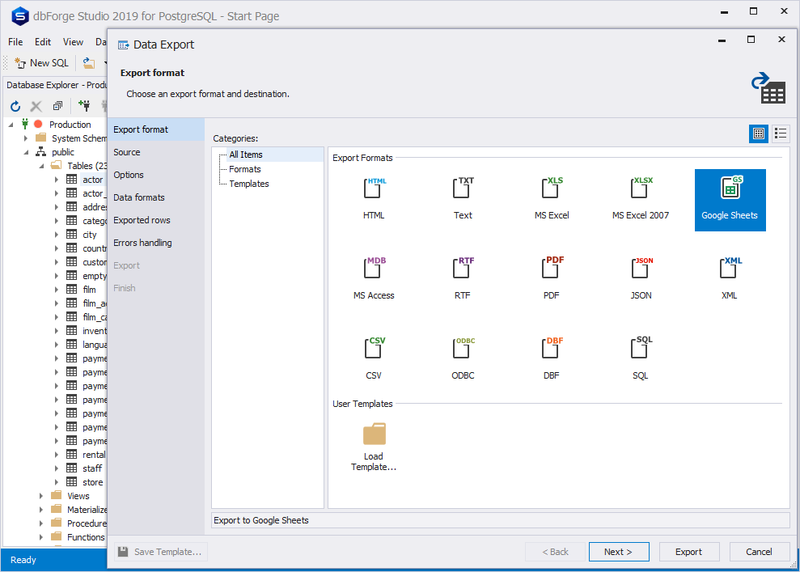 dbForge Studio for PostgreSQL supports over a dozen widely used data formats and includes a number of advanced options and templates for recurring scenarios. A tool for a simultaneous data view in related tables. It is also convenient for quick data analysis and locating specific records and logical errors in the database. The visual diagram helps setting up communications in a few seconds and go directly to view. PostgreSQL Report Builder with support for chart plotting converts your data into a good-looking report. 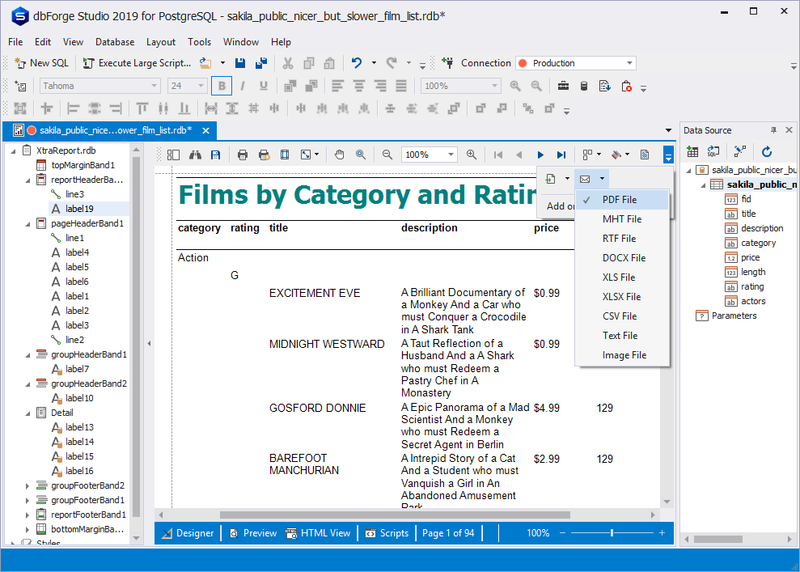 This PostgreSQL data analysis tool also allows you to build visual PostgreSQL data reports in 9 different formats. 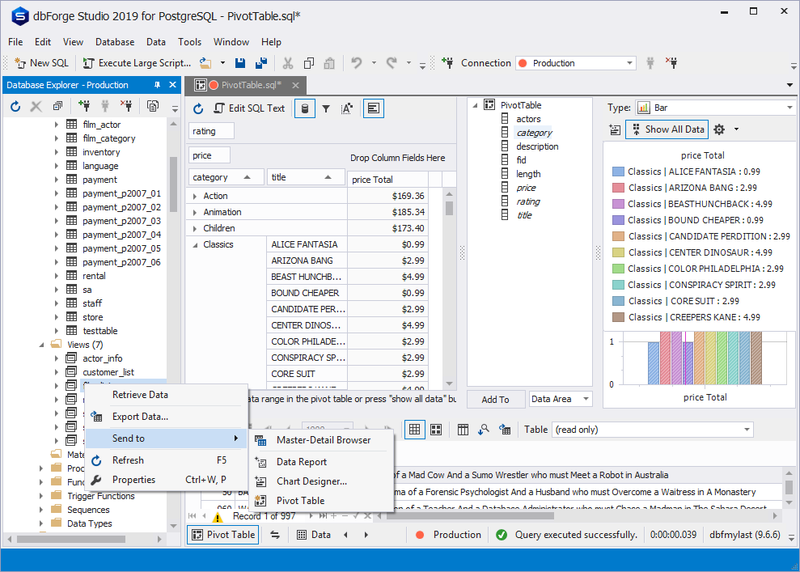 With pivot tables, you don’t need to go into PostgreSQL subtleties to group and summarize your data. Visual Pivot Table Designer, advanced filtering, visual data presentation in a graph make your data easier to read, understand, and analyze. Code snippets help to boost SQL code typing. You can use predefined snippets provided in the application and create your own to insert them in SQL scripts and queries. 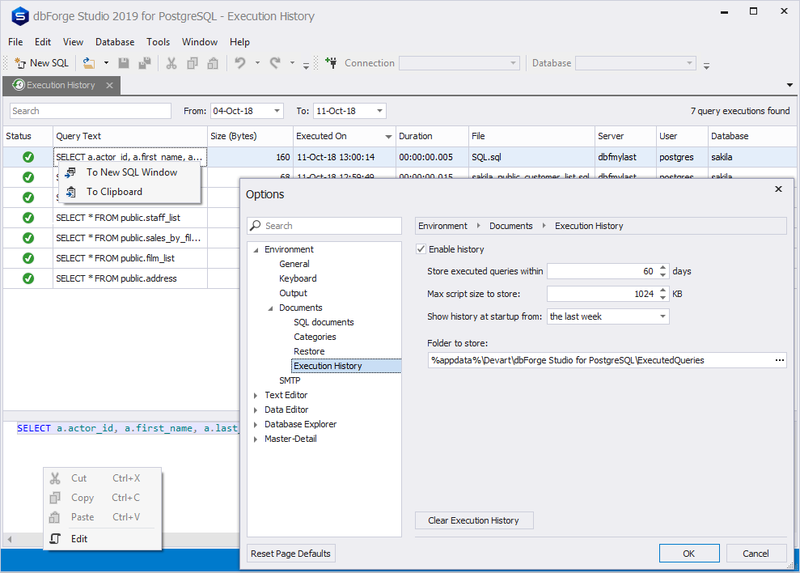 The Execution History window provides an easy and convenient way to view, search, edit executed queries. 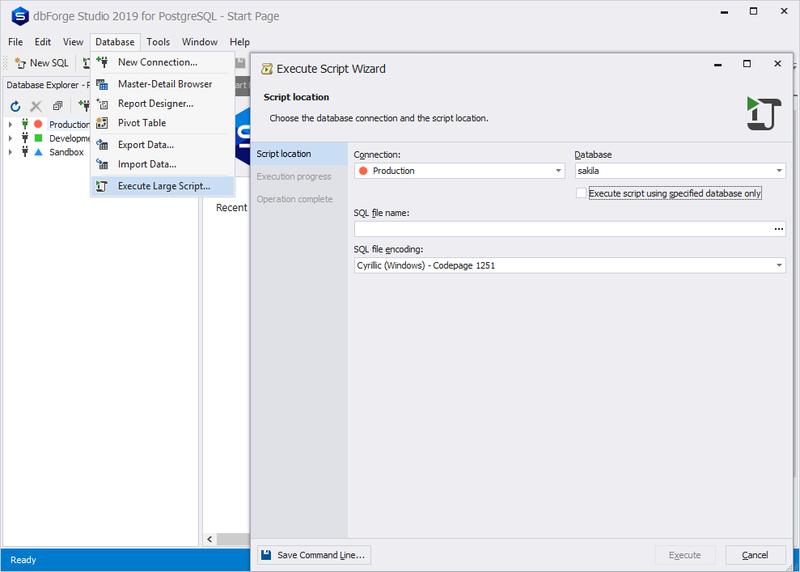 dbForge Studio for PostgreSQL allows executing large scripts with help of handy Execute Script Wizard without opening them in the SQL editor and loading the whole script in memory. When writing the FROM statement, the schema objects (such as tables, views functions) are listed in the context-dependent suggestion list. The objects related to the current schema are located on the top of the list. 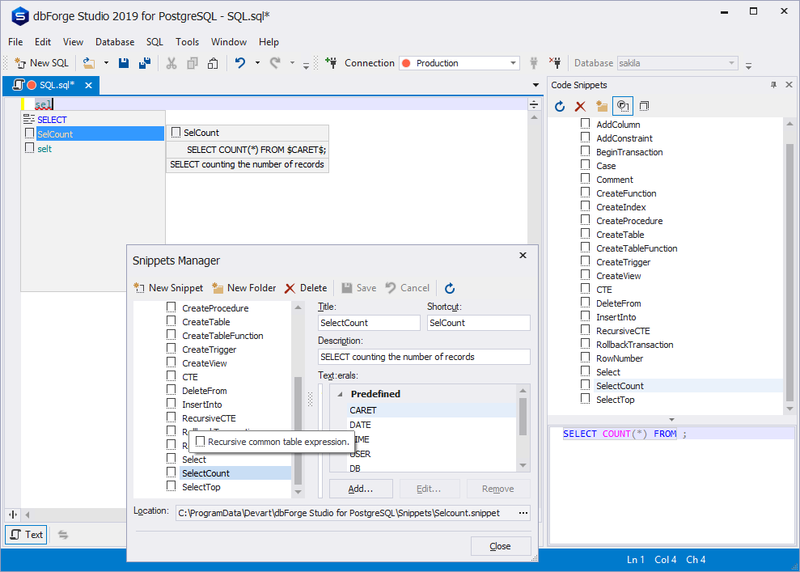 Writing SELECT queries with dbForge Studio for PostgreSQL is a snap since all keywords are prompted. SSH connection. 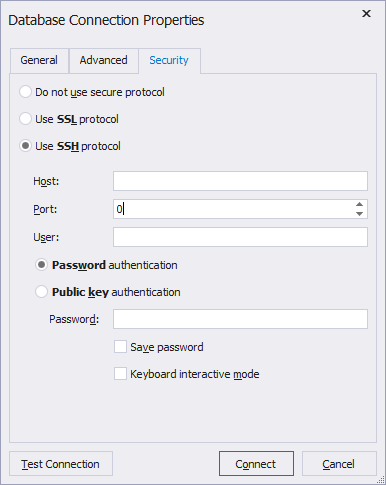 dbForge Studio for PostgreSQL now allows setting up the connection via the SSH security protocol. 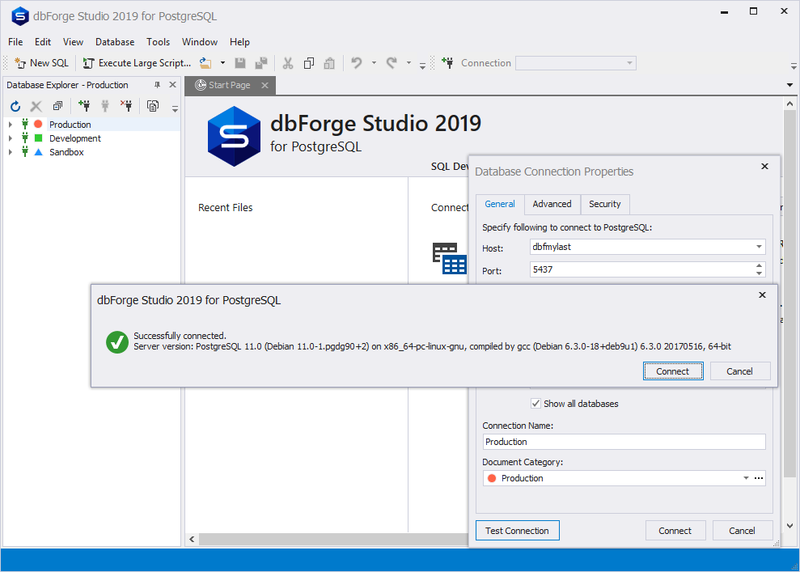 We invite you to try the new features of the new Standard edition of dbForge Studio for PostgreSQL, and share your thoughts about it with us. 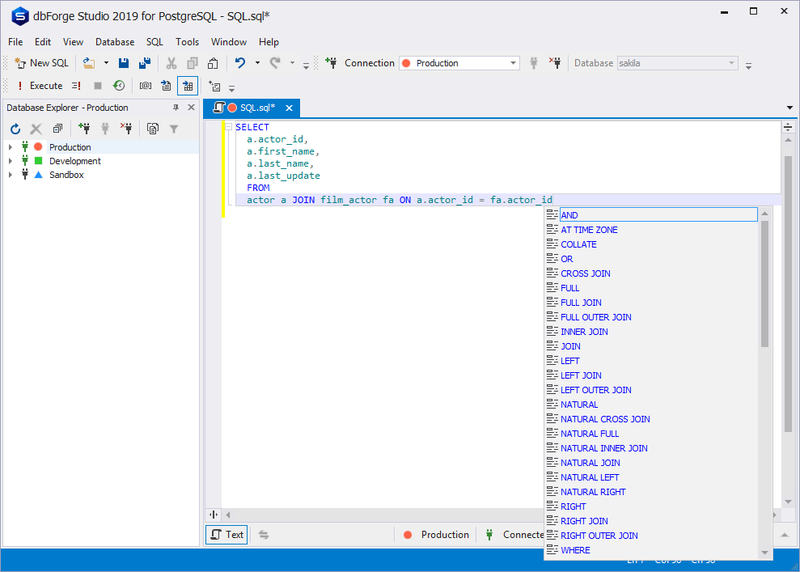 This will help us to make dbForge Studio for PostreSQL better for you. No Table Editor, No Sequence Editor, seems a long way to go!